It's been a good weekend, by our standards: we got exercise (rowing for videotaping), socializing (had people over to watch tapes from the morning video sessions, as well as some from Masters Nationals and some from the Olympics), and outdoor time (flying this morning). 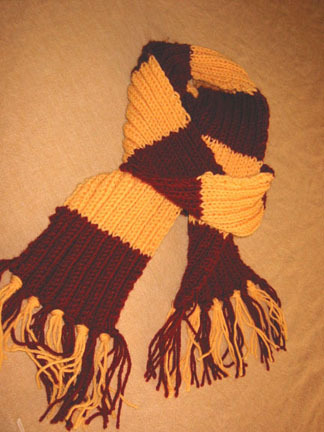 My only regret is that I almost wish I'd used Ravenclaw colors; around here, assuming it ever gets cold enough to wear it around here, people are more apt to assume the colors are those of the ASU Sundevils. Here are the two new projects I've started. The top one is meant to be Turkish stitch (I mention this because it may not be immediately obvious). This is a simple pattern with only a three stitch repeat (or two or four, depending how you look at it - yarnover, slip, knit, pass slipped stitch over, repeat) but I stilll have to concentrate while doing it, which means I can't read at the sae time effectively, dagnabbit. Also, it's hard to see what I've done with the big stitches and the bumpy yarn, which means I need to be especially careful not to make mistakes. Considering how much more complicated patterns can get, I can only assume the need for concentration is because I'm still so new at this and that it will get easier. I think it would be a lot easier in a smooth wool than this bumpy cotton. The bottom one will become the front (or back) half of a sleeveless sweater. This one is more portable and blessedly mindless; the only pattern comes from horizontal ridges in a Fibonacci series, so the only consideration is whether a row should be knit or purled and I can see what I've just done - in fact, I got most of what you see here done in the back seat of a Cessna 172 this morning. This is all a good argument for more than one work in progress at a time. Also, I'm beginning to think that though I like both Clover bamboo and Addi Turbo metal needles to work with, the Addis really are a lot faster and much easier to move fiber along. Some of that may be the smoother and slightly stretchier yarn, however.